Plantations are better than their reputation! Poplar plantations help fighting against biodiversity loss! D4EU´s short rotation poplar plantations allow herbal understorey, edges and gaps which can be an important habitat and/or food source for insects and other smaller animals. 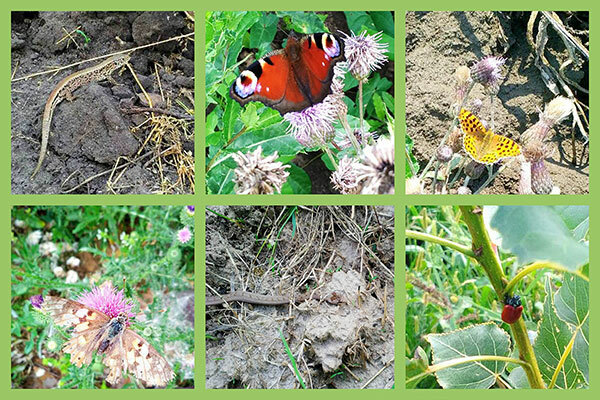 All the animals in the picture have been photographed in D4EU´s poplar plantations! Due to the perennial growth of the poplars, machine effort (e.g. tilling, ploughing) is minimized and habitats can stay intact for years. Furthermore, a tolerated understorey also reduces application of any pestici­des. Thus, poplar plantations often provide much better habitat quality for wild species of flora and fauna than common agriculture. Our Slovakian partner Daphne has done much research about which species live in our plantations: There are much more than in the surrounded corn fields. Even some rare species which have not been observed since years occurred.